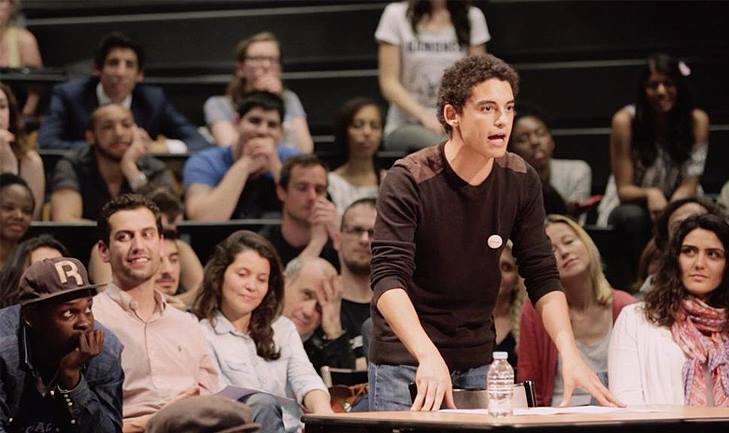 Every year, hundreds of students from all over the department of Seine Saint-Denis face off in Eloquentia, a contest to crown the best orator in this wildly diverse, sprawling suburb of Paris. Speak Up (A voix haute : La force de la parole) follows a group of college students preparing for Eloquentia through an intensive six weeks of workshops in classical rhetoric, acting, slam poetry, and breathing techniques, then into the tournament itself. Smoothly juxtaposing fly on-the-wall scenes of the group in the classroom and the amphitheatre with interviews and solo scenes with a few participants (and the future winner! ), directors de Freitas and Ly create an inspiring portrait, by turns riotous, by turns poignant, of a young generation of every creed and colour brought together by a shared commitment to the French art of rhetoric. The viewer will not soon forget Elhadj, a formerly homeless young man now running an NGO in West Africa, Leïla, a shy Syrian-French woman who forces herself to become an orator to “redefine feminism,” or Eddy, a fledgling actor from a tiny village who has to walk ten kilometers every day to catch a train to class. Discussion moderated by Christel Outreman, Higher Education Attaché at the Embassy of France. The event will conclude with a reception.